DESIRE and ATTACHMENT (‘raga’ in Sanskrit) are listed as one of the five afflictions of the human condition. Attachment accompanies pleasure and it can easily sabotage our games and our mindset. A desire rooted in the perception of ‘incompleteness’ is the basic impulse of the ego. The ego will collect information, experiences, possessions and the latest and greatest new driver to make it feel like it’s ‘good enough’. Our inner ego-ic voice probably just chimed in, “I’m not obsessed with golf!” It is the one great shot out of ninety-nine attempts which keeps us coming back for more? Or the skulled chip shot into the road sparking yet another infamous ‘helicopter throw’? No, we’re not obsessed with this game. . .we are possessed. My students and I frequently discuss the topic of ‘golf addiction’ and as some say ‘we must have a screw lose to play this game’. In golf, the ‘obsessive’ nature to practice diligently for success gives us the hyper, one-pointed focus necessary for improvement. An intense drive for development is essential. However, don’t become attached to it! The problematic circumstance of desire is that when we don’t get what we want then we may get angry. Have you ever NOT experienced anger on the golf course? Anger is a very common emotion in golf. It is a direct line to our inner environment showing us a desire has been ‘thwarted’ and we have an unhealthy attachment to the outcome. ‘Desires are inexhaustible’ and Chip Hartzranft says “There is no ultimate happiness to be found in external, impermanent things. For every transitory delight we can know (like the occasional great golf shot), a painful attachment arises.” We must continually keep checking our unpleasant attachments and their effects on our performance by practicing contentment, appreciation and gratitude. As we know, because of our ‘Human Golf Condition’, we will obsessively experience desires and attachments. We are faced with the never-ending paradoxical challenge to ‘DESIRE TO HAVE NO DESIRES’. Where in your golf game is attachment creating a problem? 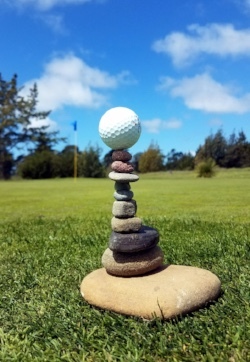 Dodie Mazzuca is the founder of Golf PROformance and teaches golf and Mindfulness for Golf programs in Santa Cruz, CA.